Keep treasured rings close with this horseshoe-inspired ring holder necklace. 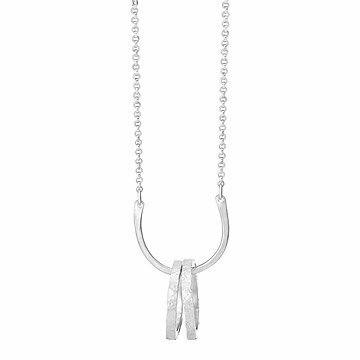 With the simple look of a lucky horseshoe, this sterling silver necklace by Jennifer Kahn has a second, heartfelt job--holding onto your most treasured piece of jewelry. When a massage therapist friend asked Jennifer for a necklace that could hold her wedding band while she worked, Jennifer got to work on this sleek, hand-hammered design. The elongated U shape makes a sweet statement on its own, while the addition of your favorite bauble lends a sentimental touch. Handmade in Burlington, Vermont. I always knew I wanted to work with my hands...make a living from my hands. I've had a love of and fascination with jewelry for as long as I can remember. The path unfolded before me, my senior year at UVM in meeting Celie Fago and discovering Precious Metal Clay. For 9 years I was her apprentice and teaching assistant and I travelled with her around the country and abroad. I've been selling my own jewelry locally in Vermont for over a decade and last year I started my wholesale line. My designs fuse old and new, industrial and natural, urban and ethnic. I try to put a contemporary spin on ancient designs, as I'm influenced by both ethnic artifacts and current fashion trends. Details are important to me which is why I incorporate things like rivets, stitches, patches and wraps. I gather inspiration from a pattern on a textile; the texture of a leaf; beautiful, old rusty things. I make jewelry for the modern bohemian: artists, yogis, professionals, mothers, teachers, servers, live-music seekers, tea drinkers, organic food eaters, deep thinkers & all those who appreciate comfort & style. The best compliment I get from my customers is hearing how many compliments they get when they wear my work. I've sold my work at craft shows and in galleries across Vermont and been included in exhibits in the US, UK and Japan. My work has been featured in top jewelry magazines and several books; and made the cover of the Lark book "Stitched Jewels". I love what I do and feel very lucky to being doing it! *My JK logo is not only my initials, it is also the Chinese symbol for "Forever".